Way back in the last century (remember the 20th Century? ), and even through the beginning of this century, estate planning for apartment owners focused primarily on estate tax savings. However, with the “The American Taxpayer Relief Act” (“ATRA”) effective in 2013, estate planning for most apartment owners turned upside down. Before ATRA, estate planners and their clients emphasized planning to reduce estate and gift taxes, fearing that estate tax exclusions that began to expand in 2001) might expire under President Obama. Indeed, if those expanded exclusions and reduced rates expired, the estate and gift tax savings from keeping assets out of one’s estate would have become the primary estate planning tax concern of most income property owners. ATRA reduced the effective estate and gift tax rate permanently from 55% to 40%. ATRA also made permanent an expansion of the exempt amount you could give or leave to your heirs without estate taxes to $5.25 million, growing annually with inflation (now to $5.43 million per person in 2014). The excluded amount could be doubled (now to $10.86 million) for a married couple. Further, “portability” would now let a surviving spouse use the exemption his or her spouse did not use. The old “use it or lose it” rule would no longer apply to the deceased spouse’s unused exclusion amount. Result: Estate and gift taxes cease to be a worry for most apartment owners expecting to leave a net worth less than the exclusion amount. But, income taxes, especially in California, have become far more troubling. The top combined tax rate (including the ObamaCare tax on investment income and the California “mental health” surcharge) in California now exceeds 50%, and even the “preferred” rate on capital gains on real estate can be nearly 42%! Many estate plans done before 2013 (or after, if the planner was not sensitive to the changes in the law) included provisions that no longer saved any estate taxes, but which would have an adverse income tax result. 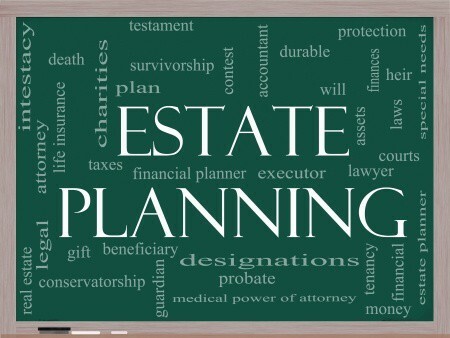 For married couples, old-style planning usually included a “B,” “Bypass,” “Credit Shelter,” “Decedent’s” or “Exemption” trust to use the exclusion of the first spouse to die and keep the excluded assets out of the survivor’s estate. This precludes a step-up in basis on the death of the surviving spouse, since assets kept outside his or her estate will get no step-up in basis at death. In fact, the loss of the step-up in basis can cost your heirs hundreds of thousands, or even millions, of dollars in unnecessary income taxes. Assets that traditional planning keeps outside the estate do not get a new income tax basis (“step-up”) upon death. Moreover, strategies used to reduce the value of the estate (including LLCs and other entities) can lead to property tax reassessment costing tens of thousands of dollars per year. 1 Measure the tax impact of any strategy on each of income, estate, gift and property taxes. Make sure that the terms of your trust, or the use of an LLC or other entity, does not prevent use of the parent-child exemption from property tax reassessment. 2 Do not structure your trust to require a “B,” Bypass, Credit Shelter, Decedent’s or Exemption trust for the property of the first spouse to die. Such a trust will not save any estate taxes unless you have a very large estate But, such a trust will have a very adverse impact on income taxes for the family. 3 Don’t make lifetime gifts of property that is worth more than its income tax basis. Unless you want to get out of owning and managing appreciated property, keep the property (or do 1031 exchanges with it) until you die. This can give you maximum income tax forgiveness from the step-up in basis for Federal and California income tax purposes. 4 Don’t use an LLC or Family Limited Partnership (FLP) to hold appreciated property unless you are certain that the benefits thereof will outweigh the adverse income tax (reduced step-ups) and property tax (likely reassessment when transferred to children) consequences of such ownership. Unless your estate will substantially exceed the amount you can protect with your estate and gift tax exclusion ($5.43 million for an individual, and $10.86 million for a couple), discounting (and lifetime giving strategies using LLC or FLP interests) are more likely to INCREASE the tax burden than to lessen it under current law. 5 Remember that good estate planning means more than just minimizing taxes. Structure your plan to protect the property you leave from your heir’s creditors and ex-spouses. You can do this and still leave them plenty of flexibility to spend the inheritance you leave behind. Think about the benefits of using good planning and drafting to prevent “affluenza” from ruining your grandchildren. The good news is that we have strategies that can reduce, or even eliminate, estate taxes for most clients with larger estates. For the larger estate, FLPs and LLCs can facilitate substantial estate tax reductions. They are often combined with strategies to leverage your exemptions, including sales to grantor trusts and the use of Grantor Retained Annuity Trusts, Self-Canceling Installment Notes, Charitable Lead Trusts, Charitable Remainder Trusts or Qualified Personal Residence Trusts. But, you should not treat any of these strategies as a “product” you can buy and expect to get good results. Instead, each works well only as the end result of careful planning, and each has both benefits and detriments. Finally, there are ways to both substantially reduce the estate tax burden and at the same time get full, or nearly full, step-ups in basis. These advanced strategies are beyond the scope of this article, but are all tools we have used with estates expected to be over $11 million to over $400 million. If you have been successful enough to have a large estate, feel free to contact me to explore how those strategies might work in your specific situation. Mom and Dad had a living trust drafted in 2001. By 2013, Dad was suffering a terminal illness. Their old living trust included a house worth about $1 million (tax basis about $250,000) and an apartment building worth about $2 million (tax basis about $180,000, now fully depreciated). Mom and Dad’s total estate was less than $5 million. The assessed value of the house and building for property tax purposes totaled $600,000. The family wants to keep the apartment building after Mom and Dad die. Mom and Dad titled the house and apartment building in joint tenancy decades ago. Later, they contributed the apartment building to an LLC owned by their living trust. Their living trust provided for dividing the assets into equal parts upon the death of the first spouse, with the survivor’s half going into a “Survivor’s Trust” and the deceased’s half going into a “Bypass Trust.” The Bypass Trust would not be included in the survivor’s estate, to take advantage of the first spouse’s estate tax exemption. 1. When Dad dies, only his half of joint tenancy property gets a “step-up” in basis, even though held in their joint trust. Their CPA estimated that this would reduce the depreciation they could take after Dad’s death by about $22,000 per year, at an estimated income tax cost of about $10,000 per year. 2. When Mom dies (she has a life expectancy of another 15 years), only her half of the property then gets a “step-up” in basis. Their CPA estimated this would cost the family another $6,000 per year from lost depreciation. 3. When Mom dies, the LLC interests left for their children will lead to property tax reassessment. Mom and Dad estimated this will cost $25,000 per year for 30 years (a total of $750,000!). After we discussed these problems with Mom and Dad, they asked us to restate their living trust to make sure their assets would be used the way they wanted; to convert the interests in the house and apartment building to community property (new deeds not needed); and to eliminate the LLC. 1. Both the apartment building and house will get a full step-up in basis, both when Dad dies, and again when Mom dies. This should save about $250,000 of income taxes over Mom’s life and upon sale of the house. 2. The step-up in basis at Mom’s death should save $300,000 of income taxes over the life of the children. 3. By taking the property out of the LLC, and restructuring some of the terms of the living trust, the anticipated property tax savings over the children’s lives should exceed $750,000. TOTAL ANTICIPATED TAX SAVINGS: MORE THAN $1 MILLION! Every family needs good estate planning. Now, more than ever, such planning needs attention to preserve and obtain income and property tax benefits under the new 21st Century tax regime. For most apartment owners, estate planning for income and property tax benefits will preserve more wealth for heirs than old planning for estate tax benefits. If you drafted your plan before 2013, you should have it reviewed by a competent estate planning attorney that cares about income, estate, gift and property tax consequences. And, if you have a large enough estate to worry about estate taxes, you owe it to your family to explore whether advanced estate tax strategies can save millions of dollars for them.